One thing I’ve learned after more than 30 years working in and around development is that while it may not be rocket science, it isn’t a no-brainer activity. Just do it may work well for exercise (though, as a long-time gym rat I can tell you about the dangers of that), but fundraising does require thought and yes, planning. I’m not talking about the once-a-year (or every few years) major effort to build a strategic development plan, though that can be an important piece. No, the planning I’m talking about is the one you should be doing for every single action you take and every single donor you speak with. These plans don’t always have to be formal, but they should be concrete and complete. Before you take an action ask yourself: Why am I doing this? What is it that I hope to achieve? If you can’t answer those questions, then maybe this is something you shouldn’t be doing. Now, I admit, that for many of our actions the answer is, “Because my boss or the board told me to” and “to keep said boss or board off my back.” It may not raise any money, but then again, doing it will probably keep you off the unemployment roles. Or perhaps they haven’t made a gift to your organization, but they have to something similar. Find out about that relationship and then connect the dots to yours. 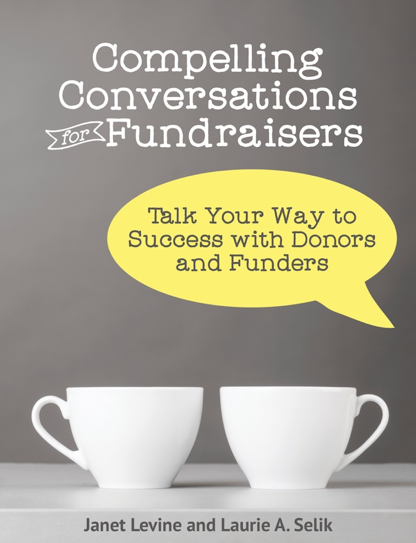 Planning will allow you to navigate pathways that will help to bring your prospect or donor closer to you. And closer is always the direction you want them to take. Is this a get to know you meeting? Or a pass on more information one? Do you want to take the prospect’s pulse or move him or her further along the path toward a gift? Or perhaps the gift has recently been made and you want to tell the donor what is happening? Before you go, be very clear about what it is that will make you feel that the meeting was a success. And then, make sure you think about next steps. This is the piece where we too often fall down. We’ve gone, we met, we’re done. Not. Every meeting has a next step, just as every step leads to another. Make it a habit to think about next steps before you embark on your meeting, make that phone, send that piece of correspondence. Once you’ve done whatever it is that is immediately to be done, look at the next step you’ve considered. Does it still make sense? What changed, if anything, to make a different next step more viable? And then, as you are taking whatever next step you’ve decided upon, think about the step after that. Make sure, however, that as you are thinking about individual steps you are not losing sight of the rest of the landscape. One misstep and you can find yourself down the proverbial rabbit hole—which is definitely not where you want to go. Janet Levine works with nonprofits and educational organizations helping them to get their development programs where they want to go. Learn more at http://janetlevineconsulting.com. This entry was posted in fundraising, planning and tagged planning, strategic development. Bookmark the permalink.